I’ve grown a bit wary of josei romances. I’d prefer them not to be smutty, or to derive much of their drama from misunderstandings, or to feature a controlling male lead. Happily, Everyone’s Getting Married avoids all of those things! Twenty-four-year-old Asuka Takanashi enjoys a successful career as a real estate broker, but what she really wants to do is get married, quit her job, and become a full-time homemaker. I struggled to identify with her at first because of this, but Miyazono does a great job showing how serious a person Asuka is. This isn’t some idealistic fantasy she’s concocted. Asuka works hard at her job, and we soon see that she absolutely will work just as hard to provide a warm environment for her family. Too, the more negative reactions Asuka gets, the more it’s clear for the reader that it’s nobody’s business criticizing her choice. Unfortunately for her connubial dream, right after Asuka catches the bouquet at a friend’s wedding, her long-time boyfriend breaks up with her, saying, “You’d be happy with anyone who puts a ring on your finger.” Asuka tells herself this isn’t true, but immediately begins attending mixers and matchmaking events, looking for a potential husband. Meanwhile, she keeps running into handsome newscaster Ryu Nanami, who flatly declares, “I’d rather die than get married.” She tries to squash the feelings that are developing, but by the end of the volume they’re going out, even though neither has changed their mind about matrimony. All in all, this was a nice surprise and I look forward to volume two! 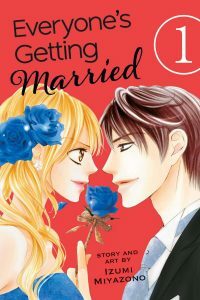 Everyone’s Getting Married is ongoing in Japan, where it is up to five volumes. VIZ will publish the second volume in English in September.